Hooray hooray! We’ve got there everyone! Janathon is complete – phew! Large drinks all round I think. My hope of a 7k minimum run this morning went quickly out of the window when I started out. My legs were feeling tired, it was a bit foggy and I couldn’t face the route I had in mind in the dark of the very early morning. A quick mental recalibration and I decided on something that would still push, but a slightly shorter distance – so it was 6k with a couple of hills for good measure. And it was good. I went a bit faster than I have been for a couple of weeks and finished with an average pace of 6.15/km, which is getting closer to being back where I like to be. And so for the all important totals…………….. In all it has been a very positive experience. I’ve struggled at times with both the exercise and the blogging, but I am so pleased that I stuck with both and finished on a high. Over the month I have lost around 5 kilos, which is fantastic (and one cat, which is very sad – but not Janathon’s doing) and I am feeling far fitter than I did a month ago. My next race is in March – a Clapham Common 10k – with the Bupa 10,000 in May, and was delighted to receive an email from Epilepsy Research UK confirming my place on their team for the Royal Parks Half in October. I am pretty sure there will be more though. I do like a medal. 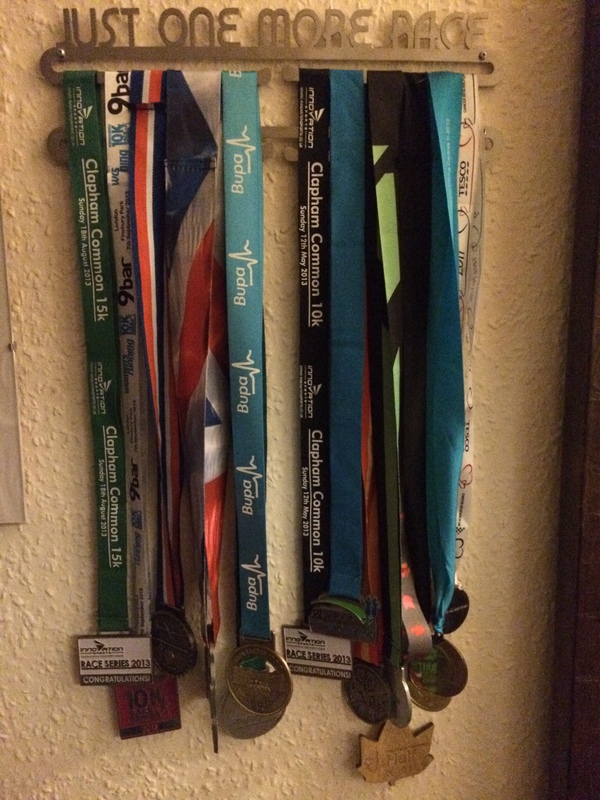 Has anyone made a Janathon medal yet…? I don’t think I’ll be joining the Juneathon as I’m travelling quite a lot that month and it will be hard to keep up with the blogging apart from anything else, but I shall read all yours with a mixture of envy and relief and am already making a 2015 resolution to see you all again for next year’s Janathon. And I promise to try and keep up the blogging! 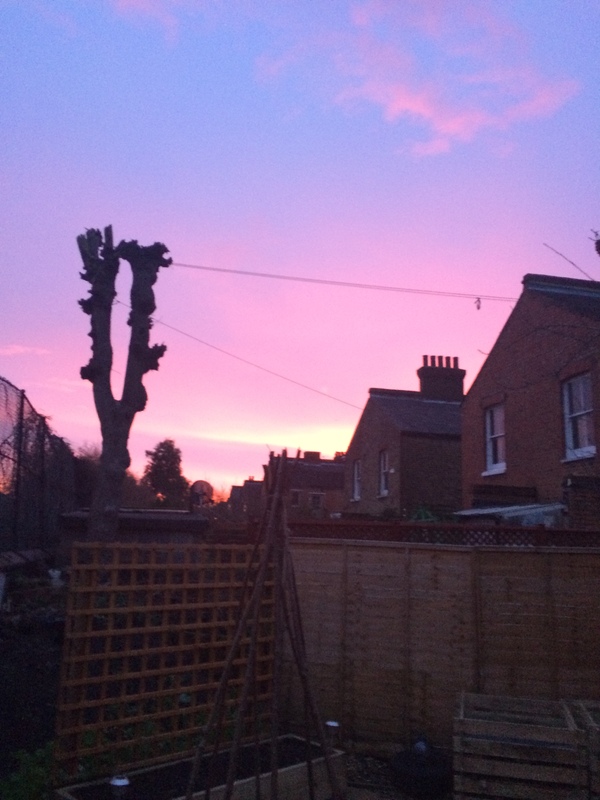 Hold on for one more day… That was what rang through my head when the alarm went off this morning. Consequently, Wilson Phillips have been rocking my world all day and it seems like an appropriate thing to share with you all. Isn’t that lovely and cheesy? I miss the 90s. Anyway, today was a weights and resistance session, giving my legs an all important rest ahead of tomorrow’s FINAL JANATHON RUN! Exciting stuff. I was kicking myself today, because if I’d thought about it properly I could have planned to run to work tomorrow, which is about 8 miles and would have counted as my long run. If it were summer I’d have done it anyway and just carried my stuff in my backpack, but winter means needing a coat and I can’t fit that in my bag, let alone carry that and the rest of my gear all the way in. Oh well, I’ll decide the length and route tomorrow I think, but I’m hoping to do at least 7k. Gosh we really are nearly there aren’t we? I don’t often do intervals on my weekday runs because it can be hard to ensure that I’ll get a decent enough stretch of pavement to run along unbroken. It was also a bit silly of me to choose Wednesday, which is bin collection day in our neck of the woods, so that means a bit of a slalom course in some places – not the best way to maintain a steady pace. Still, I managed the six minute-long intervals with a clear distinction in pace from the recovery runs and my shins didn’t complain too much, so overall I was pleased. Unbelievably, given today’s interminable rain, my run was dry. I guess there are some advantages of heading out early. I also saw a very cute fox couple chilling out in one of the gardens I passed by, although I was on my last interval so couldn’t stop to take a pic. Awww. Janathon day 28: a probiotic solution? Today’s run was 5.3k around the ‘hood and I was very pleased to see that, ignoring a blip in the second km, I got progressively faster with each km. Only by a second or so each time, but faster is faster! I think the blip was caused by navigating my way around a fallen wheelie bin and its spilled contents and then pausing to consider taking a photo, but thinking better of it. 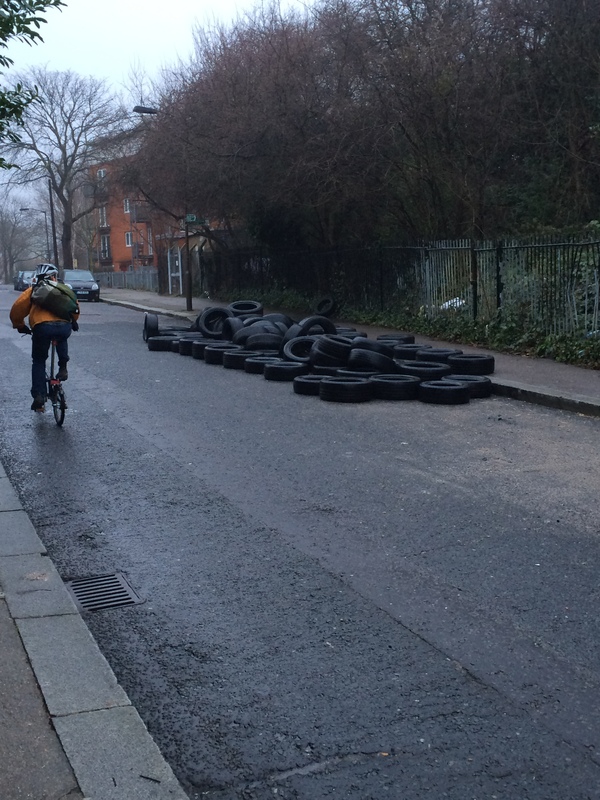 On the plus side, the pile o’ mattresses was completely cleared, so that’s at least one fly-tipping mess sorted. Good old Lewisham Council – my tax dollars at work. Janathon day 27: are we nearly there yet? Today was a day off running, so it was back to the weights for some strength training. Only three more Janathon runs left <sniff> – I shall be running tomorrow and probably Wednesday, with another weights session on Thursday and I’ve got to finish the month on a run really, don’t I? My flakey sister flaked out on me this morning – some nonsense about being tired from traipsing around a trade fair in Paris all day yesterday – so I was left to my own devices for today’s run. Had I been running with her as planned we probably would have given the intervals another go, but as I’m not very good at doing those by myself I decided that I’d go for a 30 minute fairly gentle run on a hilly route. My route took me through one of the parks I walked through last week – Ladywell Fields – and included a couple of short steep hills, a curly-whirly footbridge over the rail tracks, and a long gentle hill. My legs were a little tired from yesterday’s long run, but I managed 4.5k in the 30 minutes, which I was pretty pleased with. Plus the second half of the run was faster than the first – hooray! I tend to go running with my sister on Sundays and she’s not quite up to the same distance as I am yet, though we will be running the Bupa London 10,000 in May together so that is bound to change sooner or later. Anyway, because of this I have Saturdays as my LSR day, which is good because it keeps me on the straight and narrow on Friday nights (mostly) and bad because it keeps me on the straight and narrow on Friday nights. 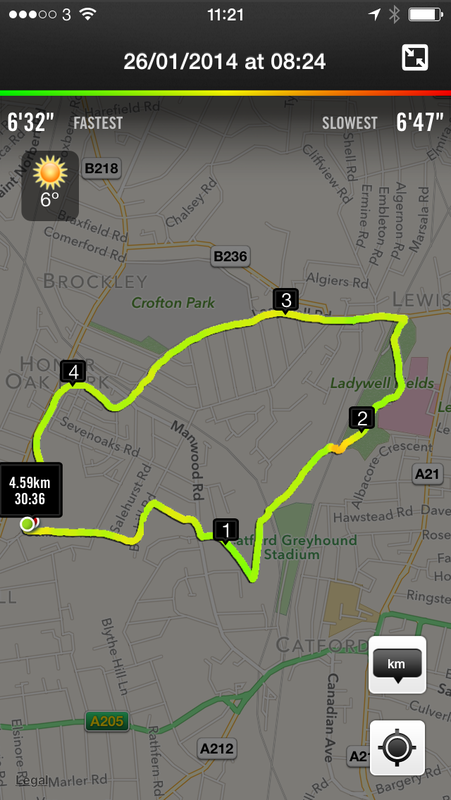 Last week’s LSR I managed 10.5k and hated every single step of it, so I was really hoping for a better run today. I got my wish! I’m getting a little bored of my regular routes and have a feeling that this boredom contributed to the rubbish runs of the last week, so I decided to mix it up a bit. I ran down to Peckham Rye as usual, but instead of heading straight back up and over to Brockley, I decided to head west towards Dulwich. I ended up at Dulwich Park and did a lap around that – just at the same time the Park Run started. That was nice, it almost felt like I was a part of it, but it also made me feel guilty because it’s the one I’m technically registered with but have never run. Having already run 6k and not having my barcode thingy with me, I decided that this was not the day to start! 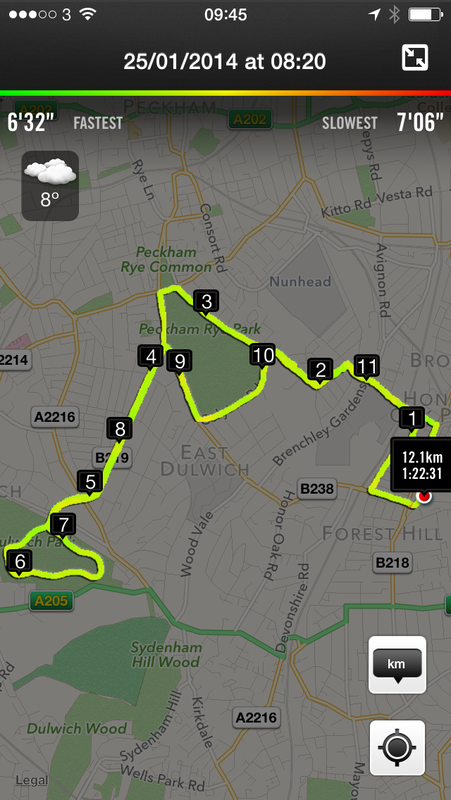 Just the one lap of the park and back down to Peckham, then up the hill and home. 12.11k done! In your face last weekend! It was great. 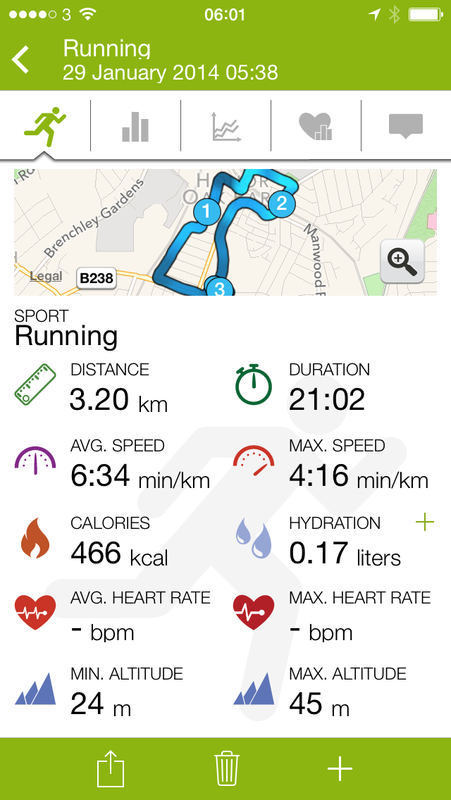 I slowed my pace down to an average of 6:50/km and the distance was tough but manageable. My legs really only started to tire in the last 2k, although that was mostly up hill which probably had a lot to do with it. I’m just delighted that I’m hitting that kind of distance again, which I haven’t done since running the half in October. Obviously my distances were even greater then, but today I managed to get back that same comfortable feeling I used to settle into in a LSR. I hadn’t realised quite how much I’d missed them.